In 1868, John Smith and his son, William set up business – John Smith & Sons – here. On John's death, his sons William, Edward and Albert, and J. I. Mortimer established John Smith, Sons & Mortimer here. By 1922, when William died, It had become the largest woollen manufacturer in the district. There were 3 mill buildings. In 1970, when some of the older buildings were badly damaged by fire. The newer parts of the mills escaped damage. However, the old chimney developed a bad crack and was deemed to be unsafe some months after the fire, and it was decided to demolish it. The demolition by George Drake (Steeplejacks) Ltd Bradford took place in January 1973. The plan was to prise bricks out of the base, insert rods and rock the chimney into one of the mill dams that had been specially emptied by Brighouse Fire Brigade. The demolition went wrong, the chimney fell the wrong way and came down on top of the one remaining mill, destroying the spinning shed and the new machinery. The insurance did not cover the cost of reconstructing the property. Built in 1879 for the Halifax Flour Society. The foundation stone was laid in 1862. Beneath the stone were sealed bottles containing a complete set of British coins, balance sheets for 15 years' trading, copies of the rules of the Society, sample voting papers, lists of the directors and employees, 2 histories of the Society – written by the Secretary and the Treasurer, a copy of the Mark Lane Express, a copy of the Halifax Courier, a copy of the Halifax Guardian, and a few grains of corn. The mill had 48 pairs of mill-stones which were driven by two 40 hp engines. In 1916, the mill was sold to the Co-operative Wholesale Society. The closure of the flour mills at Bailey Hall, in the 1930s, affected usage of the Halifax Branch canal. In 1945, it was sold to Paton & Baldwin's. In 1951, it was sold to John Mackintosh & Sons. The mills are now a part of the Nestlé site, and can be clearly seen from Halifax railway station. Jonas Wright was a corn dealer here . It was owned by the Richardson family of Bierley Hall. Around 1885, the machinery was removed from the mill and it was used as a warehouse by Clayton & Company. Recorded in 1853, when it was occupied by John Briggs & Son. Wharf Street. 19th century brewery. Wharf Street. There were 2 factories, one either side of the Rochdale Canal. Timothy Bates founded Timothy Bates & Company here in 1786. Mytholm. There were also Bankfoot Lower Mill, Hebden Bridge and Bankfoot Upper Mill, Hebden Bridge. Built in 17??/18??. On 30th April 1875, a fire at the mill caused damaged estimated at around £350. The houses of Colden Close now stand on the site. Associated with Bankfoot Mill, Hebden Bridge. In 1908, the mills were gutted by fire. A lower pit was opened at Bankwell Corner . The pit closed in 1921. There was a fatal accident here on 6th October 1855, when the mine was owned by Haigh, Green & Company. Burnley Valley. Cotton mill recorded in 1808. 4-storey mill to produce carding equipment and belting built by the Barber family at Barker Royd, Southowram. The mill produced gas which they supplied to the houses in the nearby Halfpenny Can area. In the 1930s, the mill was used by Rose & Bradley. The building has been converted into apartments. In 1864, Samuel Dawson was killed in an accident at the mill. On 6th December 1882, there was a fire at the mills and 1 man was killed. Established by the Sunderland family around 1910. In September 1966, it was announced that the mills were to be converted to a supermarket. The mills were occupied by the Asda Supermarket and the Yorkshire Antiques Market. Stood at the junction of Beech Street and Pellon Lane. A later name for the Hebble End Works. Aka Gig Mill, Thrum Hall Mill, Beeston Mill 17th century mill. In 1663, it was divided into 2 houses. In 1736, Mary, wife of John Royds, added the mill to the family estate. An iron waterwheel was added later. The old engine house is dated M. R. 1736 for Mary Royds. In 1810, the mill was split off from Thrum Hall. The property was withdrawn at £500. The Mill burnt down in 1924-1926. Coalmine on land between the Calder and Calder & Hebble Navigation. It was in production from the late 18th century. TO BE LET OR SOLD with immediate possession. BINNS BOTTOM COLLIERY in the Township of Southowram, in the parish of Halifax within about one mile of Elland. Beacon Hill Road / Godley. A mill is recorded here in 1799. On the left hand side down Church Lane. Or Black Dike Mills. The mill of John Foster & Son Limited, manufacturer of woollen and worsted products. John Foster started to build the mill around 1835, on land which he acquired from his father-in-law Abram Briggs in 1834. The company's brass band was founded by John Foster in 1835. Coal mine owned by the Low Moor Iron Company. There was a fatal explosion at the pit on 14th January 1873. Later used for cotton production. Battinson Road / Long Lover Lane. Aka Blackwood Shed. Situated between Clifton and Hartshead. Aka Blue Ball Delf, Blue Bell Quarry. Upper Edge. Aka Slater Ing Mill. Recorded in 1805. 6-storey mill measuring 60 ft by 30 ft. This was a very early 3 storey cotton spinning mill, believed to be the first in this area. It was probably built in the early 1790s by Gamaliel Sutcliffe, but it burned down on 3rd March 1802 and was never rebuilt. Part of what survived was made into a house, but most remained as ruin. In 1967, boys from Dobroyd Castle School, working under their Probation Officers, pulled down the ruins almost to ground level to tidy up the countryside. Aka Cockcroft Mill, Hazel Grove Mill, Hutch Royd Mill, Lower Wormald Mill, and Round Hill Mill. 4-storey cotton mill, measuring 48 ft by 48 ft, built in 1792. Stone quarries at Bank Top / Green Lane. 3-storey mill measuring 27 ft by 24 ft, built by John Piccup around 1794. A 4-storey mill measuring 39 ft by 38 ft was built alongside around 1801. The mill later became a frizing mill for production of blankets. After 1919, the mill was abandoned. In August 1857, the mill was badly damaged by floods in the Ryburn Valley. On 10th February 1854, the mill was partially burnt down. At the time, it was reported that the mill belonged to the Earl of Scarborough. On 16th October 1875, Monkman White was killed at the mill. On 7th October 1920, the mill was damaged by fire. On 3rd July 1926, the mill was damaged by fire. On 6th July 1926, the mill was completely destroyed by fire. The site was cleared and the land acquired by Wakefield Corporation. Booth Wood Reservoir was built just upstream of the mill. 19th century coal mine beneath Swales Moor. Established by Edward Nettleton in Nettleton's Yard, Brighouse. Spinning mill. Built in the early 1800s. John Holdsworth set up business here. On 30th May 1936, the mill was almost destroyed by fire. 18th century water-powered fulling mill on the Black Brook. Later converted for other processes: corn mill, worsted mill, woollen mill. Aka Bowling Dyke Dye Works, Halifax, Bowling Mill. The mill burned down on 1st July 1847. It was rebuilt around 1849 for James Akroyd & Son by Hewes & Wren of Manchester. On 7th December 1848, a new mill was opened. An oratorio was performed when the mill opened. The employees published a letter of gratitude for the support which the Akroyds had given to them and their families whilst the mill was being rebuilt. The mill later formed a part of the Dean Clough complex. Designed by Walsh, Wilkinson & Coutts. Originally a corn mill on the south bank of the Calder. It appears as a fulling mill on a map of 1599. A Sunday School was held here around 1830. In 1858, the Whitworth's built a new 7-storey mill. They later added several other machine shops. Question: Can anyone confirm David Cant's suggestion that the photograph of the 1906 mill fire might be of Boy Mill? Closed after World War I. A woollen mill on the Colne owned by Thomas Atkinson [1818, 1833]. The cropping machinery at the Mills was an early target for local Luddites. Paper mill built on the Black Brook. Stone mine at the bottom of Bramston Street. / Branks Holme Works . Bradford Road (east side). Stood south of North Vale Mills. Built in 1844, by Henry Roberts of Gomersall. The mill was badly damaged by fire on 8th December 1883. 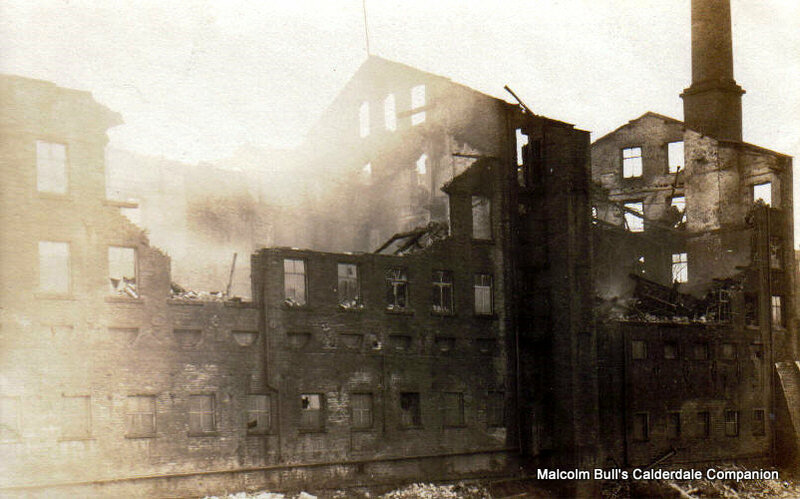 There was a serious fire at the mills on 7th September 1910. Brearley Lane / Luddendenfoot. A corn mill is mentioned here in 1296. It was a cotton scribbling mill. In 1807, the mill was used wool carding and scribbling. In 1812, it was again used for corn milling. Bridge Lanes. Originally a corn mill. In October 1916, a boiler crashed into the entrance to the mill. Built in 18?? It has been used for processing shoddy and mungo. Next to Cooper House Mill. Stood between Atlas Mill Road and the Calder & Hebble Navigation. This was a corn mill . Spring Side, Halifax Road, Todmorden Steam-powered dyeing and finishing works built around 1868. 4-storey mill built around 1870. Stood alongside the Calder at Elland Bridge. Marshall's had a quarry and factory here. The quarry was a source of the diminishing stocks of premium Elland Edge flagstone at Southowram, much of which had been exhausted after years of exploitation. The stone at Brier Lane lay beneath the offices at Brier Lodge and workshops of the Marshall organisation, with an estimated value of several millions pounds, and the decision was taken to demolish the whole complex, offices, workshops, house and all. The quarry eroded much of the northern end of Beacon Hill, as can be seen from Halifax. Aka Brig Royd Mill. Woollen mill. Stood opposite West Vale Methodist Chapel at Brow Bridge. Built on the Black Brook in 1870. On 24th July 1869, West Vale Fire Brigade tackled a small fire caused by spontaneous combustion of a heap of shoddy at the mill. The mill was demolished in 1973. Wakefield Road, Brighouse. Aka Kirklees Mill. Wool processing mill on the land between the Calder & Hebble Navigation and the Calder built in the 15th century. It was bought by John Armytage in 1571, and owned by the Armytage family until the 19th century. Built at Baines Square by Samuel Baines. There were 2 buildings of 3 and 6 floors. Princess Street / Brook Street. Northgate Yard / Portland Street. Alfred Crossley is recorded here [1861-1869]. Late 19th century 4 storey worsted spinning mill. It was an impressive 8-storey building. In 1967, the windows, doors and roof were picked out in white paint, making the building a distinctive feature of Dewsbury Road. The Gannex business closed in the 1990s. The mills was subsequently used by several small businesses. In 2001, Asda was refused permission to build a supermarket, bus station and 42 houses on the site. In June 2005, there was a proposal to convert the mill into a hi-tech office space and create 349 apartments. In 2009, plans to convert the mill into apartments and offices fell through. Pennine Housing bought the property. In September 2010, Pennine Housing said it would be too expensive to convert the building to commercial use, and announced plans to demolish the mill for 65 low-cost homes. The mill was demolished by December 2010. Occupied the land between Atlas Mill Road and the Calder. 5-storey cotton mill with extensions of 2 and 3 storeys. It was 13 windows long, and 8 windows in width. On 12th July 1918, Joe Boothroyd was killed at the Mill. Aka Mill House Chimney, Triangle. The top has been restored in brick. It was shortened in 2011. It gives its name to the Long Chimney pub, and the Long Chimney, Sowerby Bridge section of the Rochdale Road. Built by Thomas Denton. A small mill with its own water wheel and dam fed by the Holywell Brook. Recorded in the 1850s and the 1930s. Built on the Black Brook. A special leet took water from the Black Brook further west, thus giving sufficient volume and speed of water to drive the mill. The Works stood at Brookfoot and used the Red Beck to supply water for the dyeing processes and to drive the waterwheel. Later, this was augmented by water from bore-holes and by steam-engines. On 6th November 1918 one man was killed and 8 injured by an explosion at the Works. In the 1950s, a large power generation unit was built to serve the works and the nearby Craven Dyeing Company. It was a part of the Shibden Estate and was required to pay an annual fee of £11 to Hipperholme Grammar School. Recorded in 1661, when Brookefoote Milne – a water corn milne at Brookfoot – was occupied by Bridgett Scolefielde. Jonathan Richardson was here . In 1805, it was bought by John Clay and William Earnshaw – Clay & Earnshaw. John Brooke started work here before setting up his own business at Brooke's Mill in 1826. Mill on the site of the earlier Brookfoot Water Corn Mill. It was built around 1860. Brook, Hadfield & Company became the first occupants and were there when it burnt to the ground on 18th November 1863. Mill built on the site of Brookfoot Mill which had been destroyed by fire on 18th November 1863. It was built in 1865. The property consisted of two buildings at right angles to each other. There was a small fire at the Mill on 22nd November 1866, caused by friction in the machinery. It was quickly extinguished by the workers, resulting in £120 damage. One of the buildings was destroyed by fire in 18th April 1867. At the time, the property was owned by Samuel Leppington and occupied by Woodhouse Brothers. This left the building which is still there . James Akroyd of Brookhouse built a spinning mill here in 1805. The mill was powered by water which was carried by a half-mile-long headrace comprising tunnels and aqueducts. On 10th January 1829, the warehouse and a large quantity of stock were destroyed by fire. Water-powered woollen scribbling mill built about 1795 for John Shaw. In 1812, the Mill was attacked by a group of Luddites. Joseph Shaw persuaded them to break the waterwheel rather than individual machines and the mill was up and running again in 3 days. By 1857, over 1,200 people worked at the mill. The firm also imported tea from China. This was processed in a tea-blending room at the mill. The processing of tea ended around 1890. The railway line was extended from Greetland Railway Station to serve the mills. The mills were demolished in 19??. The houses at Brookroyd Terrace were built for the workers at the mill, and those at Honeymoon Square for newly-married couples. 3-storey mill at Clifton Bridge. South Street, off West Parade. The mill was earlier known as Savile Mill. Worsted mills established by Thomas Smith Scarborough and his brothers. Cousins Alfred William Whitley and Frederick Whitley Thomson had a card making business here. In the 1860s, the mills were owned by John Whiteley & Sons when they were visited by the Prince of Wales. In 1890, it was described as 5-storeys and covering an area of 13,000 square yards. Hangingroyd Lane. 19th century mill. Opened in 18?? In 1811, the mill operated 720 spindles. Demolished in 19?? Aka Burwood Mill. Originally a corn mill. In the 19th century, it was used as a woollen mill. In 1874, Samuel Magson and Samuel Cockroft, worsted spinners, leased the mill for a period of 14 years. It was owned by local farmers, the Booth family. When fire broke out at the mill on 1st May 1869, it was described as a 5-storey building. Arson was suspected as a number of healds were found tied together between the looms.